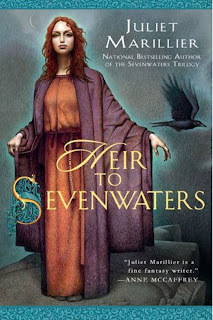 I couldn't believe it when I heard that Juliet Marillier was writing another Sevenwaters book. It's been eight years since Daughter of the Forest was first published and six since Child of the Prophecy and I honestly thought that ship had sailed. I had accustomed myself to the notion that all I would ever have would be the original trilogy to keep me warm on those cold nights when only the Sevenwaters magic will do. And then the unbelievable happened and she announced a fourth volume. And instead of following its predecessors and taking place a generation after the previous book, Heir to Sevenwaters would be set just three years after the events of Child of the Prophecy. The story follows Clodagh, the third of Sean and Aisling's six daughters, and the one the entire household looks to in times of strain and dissension. Known for her exceptional domestic skills and attention to detail, Clodagh is forced to take the reins as her mother approaches the delivery of her final child--the long-awaited son and possible heir. At the same time her father is preparing to host a council of warring chieftains and dealing with the possibility that his son-in-law is plotting against the alliance. When her new baby brother is stolen from his nursery while in Clodagh's care, everything changes, and Clodagh finds herself completely outside her realm of experience, on a journey to reclaim her kidnapped brother from the realm of the Fair Folk and prove not only her own innocence, but that of the unusual young warrior Cathal who is also under suspicion. Together, Clodagh and Cathal risk everything as they face the Lord of the Oak and bargain for their lives. Just gives me chills. The good kind. There are many such passages in Heir to Sevenwaters and the book stands out to me because of the beautiful, even writing and because of the likability of its two main characters. Clodagh is an ordinary young woman who, when thrust into extraordinary circumstances, finds resources she didn't realize she had. The courage to risk her life for her brother, but also the courage to try to be friends with a lonely young man who is not interested in being her friend, who goes out of his way to be prickly and unpleasant, who fights himself at every turn, and who no one believes in. Including himself. I loved this story. I loved its glimpses of old friends and its hints of future possibilities. As only the best ones do, it surprised and delighted me and made me long for more. I have this sitting on my shelf at home, I think I had a happy heart attack when I got it in the mail! I cannot wait to read it. Wonderful review--and I know exactly what you mean about Sevenwaters having some kind of magical hold over you. Juliet Marilier just has a beautiful way with words! I'm glad, Kathy. :) This one is different from the other three. It's quite sweet and I think you'd like it. Thanks, Thea! This fourth one was such a delicious treat. I'm still sad it's over. Hee. As well you should be. It's been years since I last read Daughter of the Forest, though I remember loving it. I've been meaning to reread it, so maybe now with a new book out I'll reread the whole series again. Thanks for the review!